The WP-580RXR is an extended range, HDBaseT twisted pair wall plate receiver for HDMI signals. 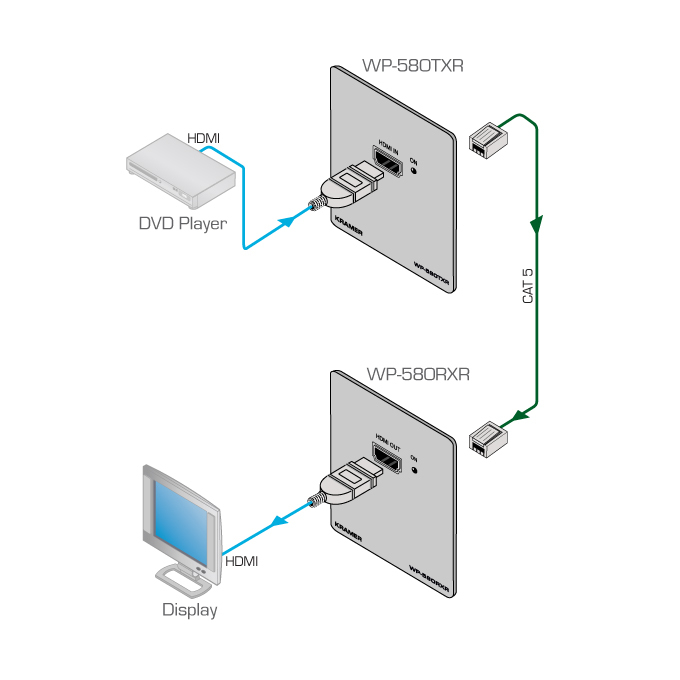 The WP-580RXR receives an HDBaseT twisted pair signal from the WP-580TXR and converts it back into HDMI signals. Max. Data Rate - 10.2Gbps (3.4Gbps per graphic channel) in normal mode; 4.95Gbps (1.65Gbps per graphic channel) in ultra mode. System Range - Up to 130m (430ft) normal mode; up to 180m (590ft) ultra mode (1080p @60Hz @24bpp) when using BC-HDKat6a cables. Cable - For optimum range and performance using HDBaseT, use Kramer's BC-HDKat6a cable. Note that the transmission range depends on the signal resolution, source and display used. The distance using non-Kramer CAT 6 cable may not reach these ranges.